Tomorrow, Samsung is set to announce the world’s first quadruple-camera smartphone. The device, which set to be known as the Galaxy A9s in some Asian market and potentially the Galaxy A9 (2018) in Europe, will bring a whole host of premium features. But with just one day to go before the unveiling, reliable tipster Evan Blass has posted an image of the device which also details the rear camera setup. As previously revealed, the Galaxy A9s will ship with a main 24-megapixel camera. This will boast a f/1.7 aperture and “Clear & Bright” technology, something that will presumably enhance images in low-light scenarios. Sitting below this will be a new 5-megapixel depth camera that will support “Live Focus” and includes a f/2.2 aperture. Similarly, a 10-megapixel telephoto camera is also included. This supports 2x optical zoom and boasts a f/2.4 aperture. Lastly, Samsung has also included an 8-megapixel ultra-wide camera which adopts a 120º field of view and a f/2.4 aperture. Completing the whole setup will unsurprisingly be an LED flash. Aside from the cameras, the image in question confirms the presence of a glass build complete with an aluminum frame and a square-shaped fingerprint scanner on the rear. Also, an elongated volume rocker is visible, as is what could potentially be a dedicated Bixby button. Specs-wise, the Galaxy A9s will come equipped with Qualcomm’s Snapdragon 660. This will be coupled with 6GB of RAM and 128GB of storage. The smartphone will make use of a large 6.28-inch AMOLED display which will be powered by a 3,720mAh battery. Also, Android 8.1 Oreo will be on board. 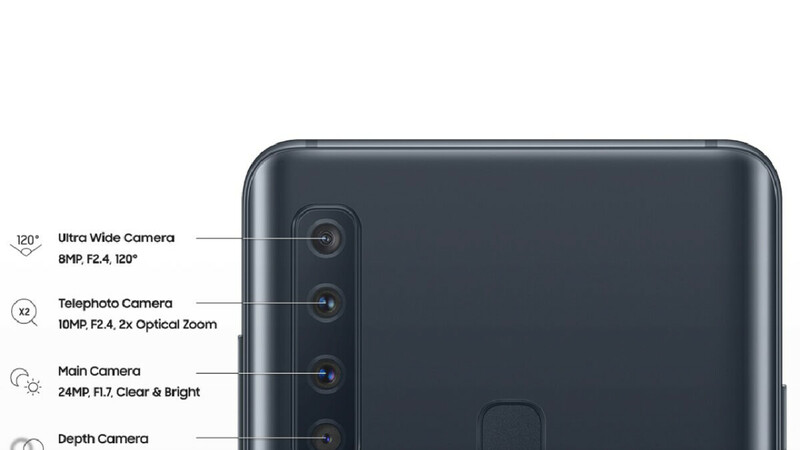 The depth camera is absolutely pointless, they didn't need a 4th camera. The others could've done it's job. A 24MP 1.7 lens? Holy mother of optics Batman!!!! What phone is gonna be able to touch this? They should have saved this for the S10. How they gonna top that? This is good if all cameras have OIS but if there's none of them, then this is just a preparatory for S10 I think.